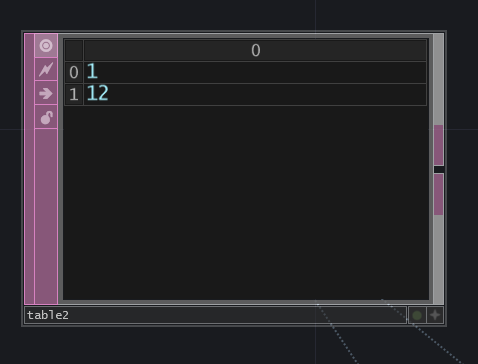 Having the flexibility to write expressions in reference fields for an operator is an incredibly powerful feature in TouchDesigner. This can free you from the necessity of doing computation outside of your reference, making for much tidier networks and programming. However, if you’ve ever tried to write a long expression, or a multi line logical test you might find yourself scratching your head about how to best make that work. Today we’ll look at how you can write a function as a module which you can then call in a parameter. First we’ll take a look at the basic pieces of this idea, and then we’ll explore what that might mean as a more complex exploration of this kind of idea. Our last line calls the function we just defined. Now, if you run this DAT, you should see our text print in the text port. 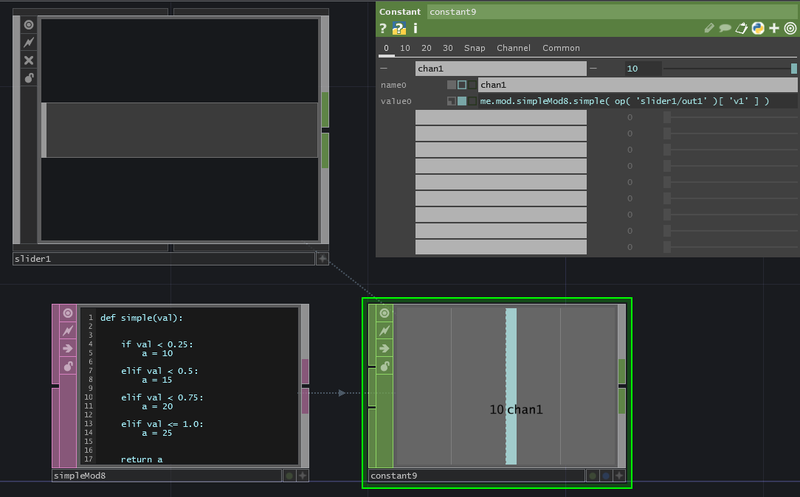 Congratulations, you’ve written your first Python Function here in TouchDesigner. This is all well and good, but lets push a little harder. Let’s change this to be a simple multiplication operation. Let’s make a simple function that converts feet to centimeters. If we do a little googling, we can quickly find that 1 foot is equal to 30.48 centimeters. Imagine we want to feed this function feet as a unit, and get centimeters back. Alright this is an awful lot of simple function writing, but not much integration work, what gives? Now that we have some fundamental pieces of function writing under our belt, let’s look at what this means for using functions in parameter references. Whew! Alright, we’ve now successfully written a function, that we’re retrieving in a constant CHOP. This, however, is highly impractical. You would probably never retrieve a constant value from a module like this – that said, it’s a helpful for us to see some of the fundamental elements that go into making something like this work. Now that we have some general concepts down, lets look at a few more complex examples. Returning values is excellent, but we can also return strings using this same method. Let’s set up another similar example. In this one we’ll need a slider COMP, a Text DAT, an Eval DAT, and a Text TOP. 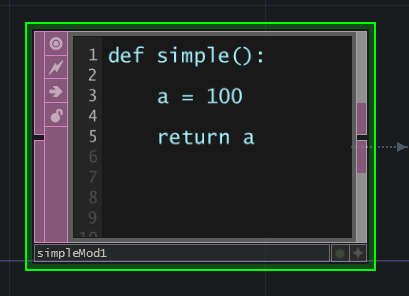 Let’s start with our function from the last example, but change our returned values to strings. 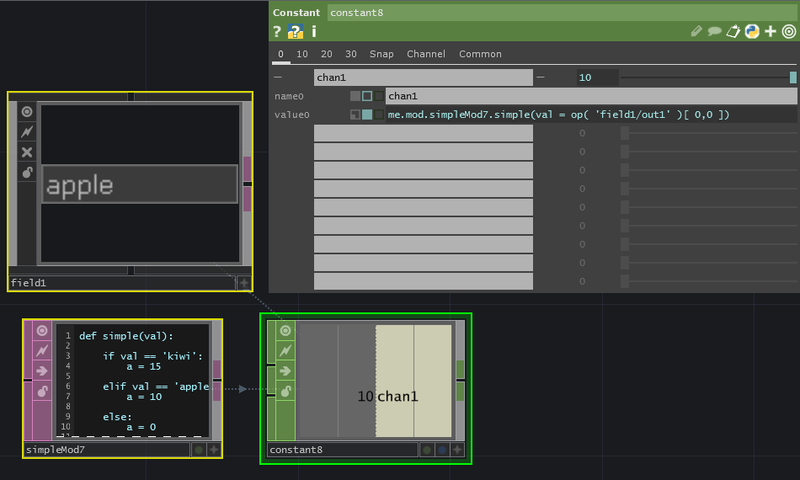 Alright, last but not least, let’s look at how we might use this same idea to test strings and return values. This time around we’ll want a Text DAT, a field COMP, and a constant CHOP. I’m going to name my Text DAT simpleMod7. Using the same ideas we’ve explored already, let’s write a function that tests our field COMP’s output and returns an integer. The way our function works, if we type ‘apple’ or ‘kiwi’ into our field, we’ll see 10 or 15 returned. In all other cases, we’ll see 0. If you want to see a set of examples head over to GitHub and look through the source examples. This entry was posted in Uncategorized on July 3, 2015 by raganmd.